Sony BDV-E370 review | What Hi-Fi? ‘Jack of all trades, master of none', goes the saying, one that all too often applies to all-in-one home cinema systems. It's not easy to cram all that technology into one box, and invariably the performance trips up as a result. But every so often there's an exception to the rule – and Sony has just delivered perhaps the best budget exception we've seen. Keeping up with the latest technology is no mean feat. There's undeniably more electronics than ever to squeeze in to modern all-in-one systems – Blu-ray, 3D, media streaming, the list goes on – if it wants to avoid falling foul of the Trade Descriptions Act. Impressively, the Sony BDV-E370 manages to do it all in superb style – and at a crazy price to boot (shop around and you can find even better deals). 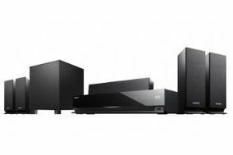 This system comes under the ‘Monolithic Design' umbrella, which Sony hopes brings a sense of stylish uniformity to its latest home cinema products. In the flesh we're not sure it particularly stands out in the world of compact 5.1 systems, but we still think it's presentable enough. And we're chuffed with how easy it is to set-up, with colour-coded speaker cables and idiot-proof connections. You'll find one HDMI output, complete with audio return functionality (though sadly no HDMI inputs) alongside two USBs, an ethernet connection, digital and analogue audio inputs and a connection for the FM tuner. Sony's auto-calibration system is accurate enough, while the XMB menu system feels like an old friend – so we're soon up and running In a break from tradition, let's jump straight into online content. Sony's Bravia Internet Video feature gives you access to an ever-growing number of content apps, most notable of which is BBC's iPlayer. Catching-up on some MotoGP or the latest episode of Sherlock is just a few button presses away – and with the quality within touching distance of Freeview, we're impressed. Add DLNA support to the mix and content options are almost unlimited. We opted for a wired hook-up, though you can add a wi-fi dongle if you want. The bread and butter of this system, however, is movie playback. No doubt taking a nod from the BDP-S370 Blu-ray player, the BDV-E370 delivers our BD of Green Zone in all its glory. There are bright, clean whites, solid, insightful black levels and rigid edge definition. Fast motion is handled with familiar aplomb for a Sony machine, and scenes that demand punch and colour are given the required vibrancy. The machine is more than capable as an upscaling DVD player too, staying insightful, sharp and steady with motion. And there are plenty more discs that this system will merrily take for a spin: DivXHD, WMV and MPEG files, among many others – and last, but far from least, the audiophile's favourite, SACD. The latter format wouldn't be much good if the speakers didn't fulfill their side of the bargain, but we're pleased to report that you should have no such worries. They might be small but they deliver surprising scale and power, with gunshots and explosions given real dynamics, the type of which is so often out of reach for ‘affordable' systems. Sony successfully shies away from any brightness with treble tones too, the system maintaining balance and control even when cranked neighbour-botheringly loud. Support for Dolby TrueHD and DTS-HD Master Audio means you're fully up to spec for HD audio, too. There's no dedicated dock, but the USB inputs are Made for iPod certified so you can charge your 'Pod and control your tunes using the Sony remote. Only the lack of an on-screen menu leaves us a little miffed. Sounding and looking as good as this system can, you'll be happy to hear that there's plenty more to play with, not least in the form of 3D. You'll need a 3D TV and the matching glasses but then, as we've tended to find so far, the 3D looks as good as the system allows. The impressive picture is brought to life in some style by the added sense of depth that 3D delivers. If you're in the market for an all-in-one system that does the name justice, then this Sony setup is hard to beat. Considering the price, the amount of technology that's crammed in to this machine really does deserve some sort of award… and who knows, in a couple of months' time, it might just get one. We expect this to sell by the bucket-load – and rightly so.